You know me, I'm a huge fan of pastels and therefore when it comes to Spring fashion and makeup trends, I get pretty excited at all the new launches. When I first laid eyes on the Estee Lauder Heavy Petals collection way back at a Christmas event last year, I immediately fell in love. The collection features five seriously stunning pastel hues, including a gorgeous coral, a beautiful baby pink, and a refreshing apple green. 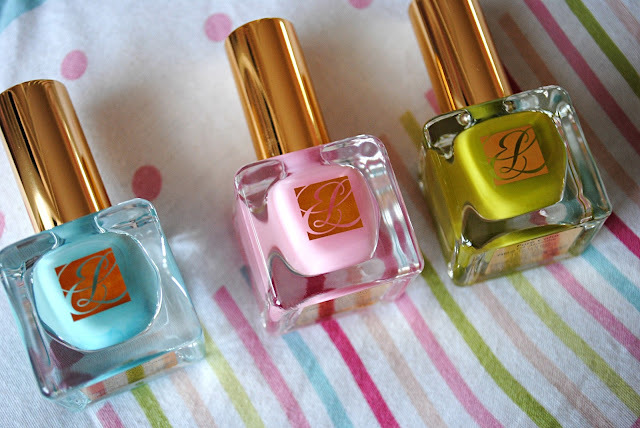 I was lucky enough to be sent three of the shades on offer; Dilettante, Narcissist and Absinthe. 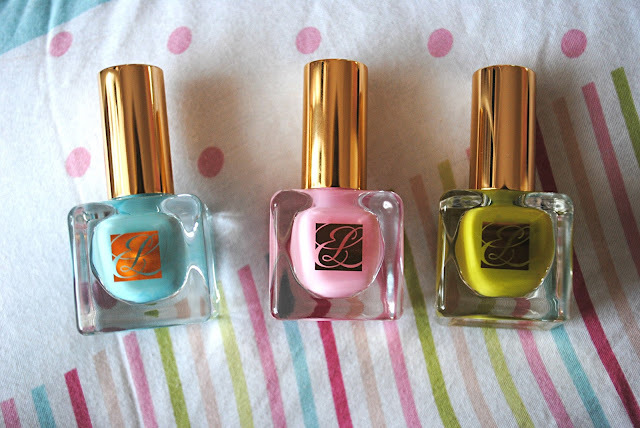 The first thing I have to gush about these beauties is the packaging; Estee Lauder is most definitely on the money with the gorgeous, thick glass casing and classic gold detail - the polishes look amazing sitting on my dressing table. But how do the products fare? Well, in short, they're the best polishes I think I've ever tried. Each one is ridiculously opaque, a dream to apply and lasts days without chipping. When on the nails, these shades scream 'I've had an expensive manicure' - they're so glossy and lustrous. The colours are so beautiful and unlike any colours I've tried before, making them unique as well as fabulous quality. Dilettante is a baby blue/turquoise, Narcissist a candy pink, and Absinthe a mossy apple green. Of the three, Narcissist is definitely my favourite (typical girly girl) but Dilettante is a close second. I do love Absinthe but it lets itself down compared to the others as the application for it is a little wishy-washy. A few coats however, and it looks just as stunning as the other shades. Overall I'm seriously impressed with the Heavy Petals collection and I already have my eye on the coral shade. 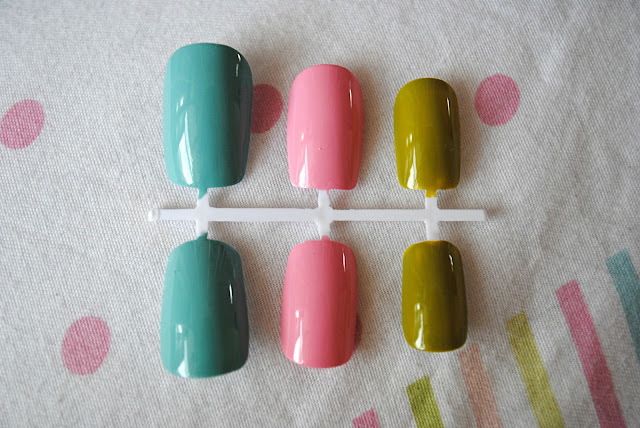 I think the shades are so pretty and typically Spring-like - they definitely make me think of Easter, sunshine, flowers and candy and when I see them adorning my finger nails! They retail at £14.50 which I don't think is too bad going for such a quality product. 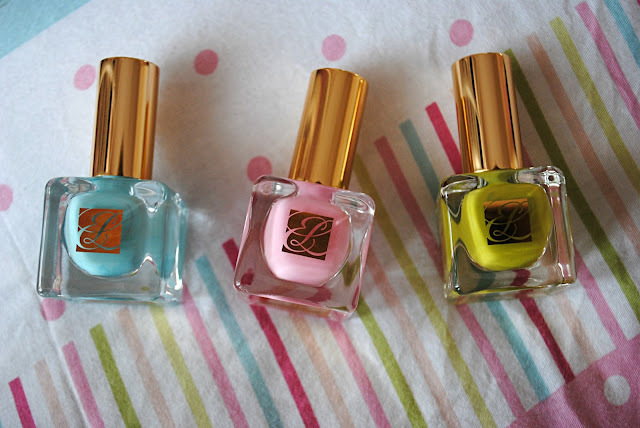 Have you tried any of Estee Lauder's polishes before? To think they've only started selling nail lacquers recently, the quality really is astonishing.